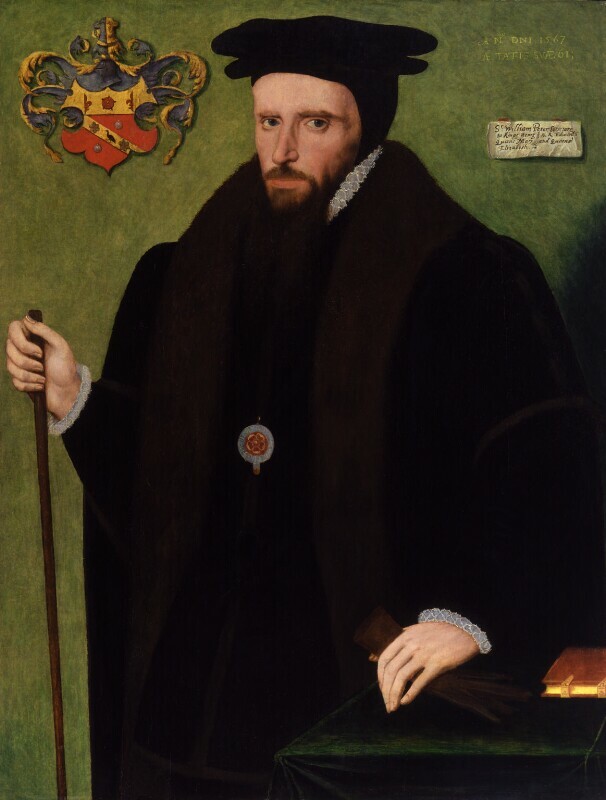 Sir William Petre (1505?-1572), Secretary of State. Sitter in 1 portrait. Petre acquired the lease of the monastic lands at Montacute after the dissolution of the priory there in 1539. He sub-let to the Phelips family who built the present house at the end of the sixteenth century. The piece of paper which is depicted in this portrait of Petre as if attached to the wall is known as a 'cartellino'. It states that Petre was Secretary of State to Henry VIII, Edward VI, Mary I and Elizabeth I. This form of cartellino was added to paintings in the collection of John, Lord Lumley and is not original to the portrait. Henry Stuart, Lord Darnley is murdered at Kirk O'Field, Edinburgh with the Earl of Bothwell implicated. Bothwell abducts and imprisons Mary Queen of Scots at Dunbar Castle and marry less than a month later. Protestant lords rise up. Bothwell flees the country and Mary is captured and imprisoned for conspiring in Darnley's murder. Mary abdicates and her one-year old son is proclaimed King James VI of Scotland, with James Stuart, Earl of Moray as regent. The scholar William Salesbury and Richard Davies, Bishop of St David's translate the New Testament and the Book of Common Prayer into Welsh. Fernando, Duke of Alva arrives in the Netherlands with 10,000 troops. Ruling as military governor under Philip II of Spain, Alva initiates a reign of terror in an attempt to eradicate Protestantism. The Conspiracy of Meaux opens the Second War of Religion in France. Huguenot (French Protestant) forces attempt to capture Charles IX of France. The King flees to Paris and the Huguenot leader, Louis de Bourbon, Prince of Condé lays siege to the city.